Once you received the notification as administrator, you can go to the item in question. Click the Still objectionable button if you want to contact the portfolio author and give them pointers on what to fix in their portfolio. Click the Not objectionable button if the content is in line with the terms and conditions of the site. When you click either button, every administrator who got the initial objectional material notification receives a notification mentioning that you dealt with the complaint. If you think a portfolio author needs to review their portfolio content as it is not in line with the terms and conditions of the site, you can send them a notification about that and also revoke access to the portfolio until the issue has been resolved. Complaint: Once you’ve clicked the Still objectionable button, a modal window is opened in which you see the original complaint. 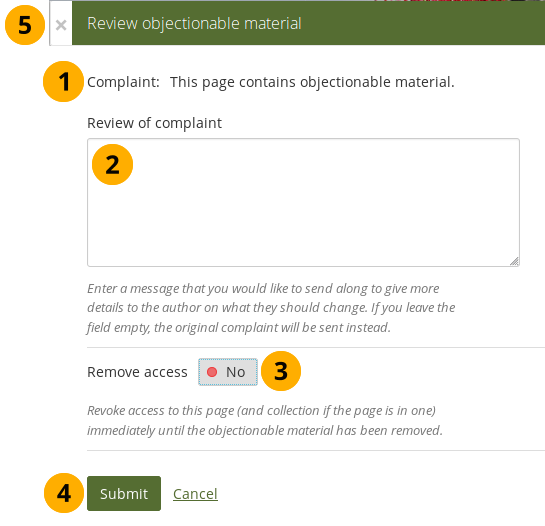 Review of complaint: Add your comments for the portfolio author so they know what they have to do in order to remove the objectionable material. Remove access: Set this to “Yes” if you want to revoke access to this portfolio until the problem has been resolved. The access permissions are suspended and nobody but the portfolio author and the institution / site administrators can view the portfolio. 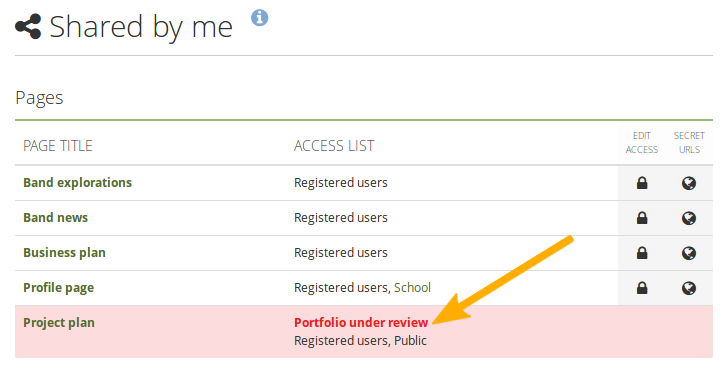 Once the access has been revoked for a portfolio, the portfolio author sees that highlighted on Shared by me. 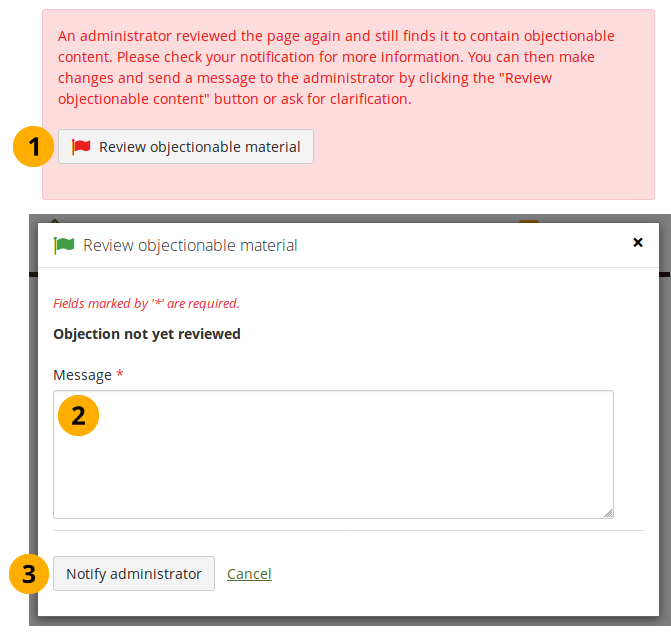 As portfolio author, you receive a notification about the objectionable material review and can fix the issues. You can then send a message to the administrator and ask them to perform another review. On the portfolio page, click the Review objectionable material button. A modal window opens in which you can type your message to the administrator, detailing the changes you have made to your portfolio that will lift the objectionable material notice. Click the Notify administrator button to send your message or click Cancel to abort your action. The administrator receives a notification and can review the portfolio again, either marking it as not objectionable or asking for more changes. 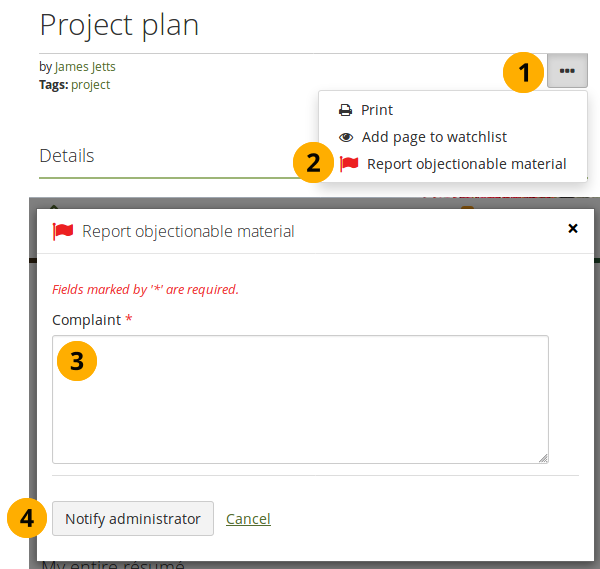 Administrators can view a report on current objectionable material that still requires an action in the administration area.